When you enable the SharePoint integration for CRM, you get the ability to view a document list view by navigating to the document area on the form. Often, users want have this list of document available directly on the main form and not have to navigate to another page. 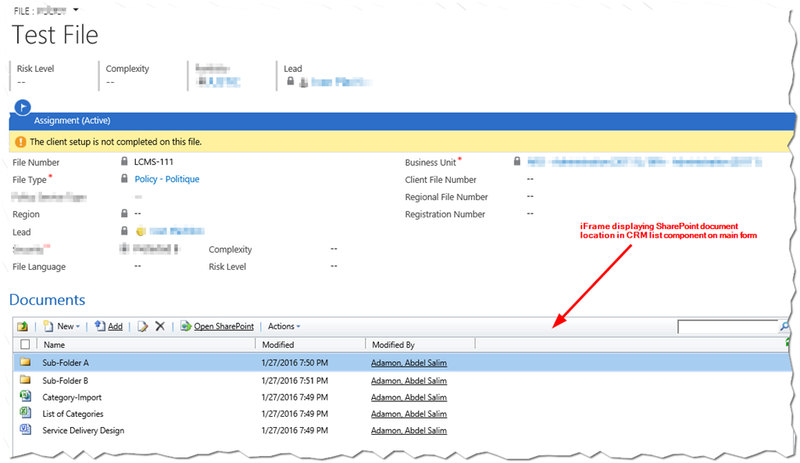 Here is one way to do it, applicable for the “old fashion” SharePoint integration using the SharePoint List Component for CRM. It does not apply to server-based SharePoint integration with CRM. This is an unsupported customization, use at your own risk. Grabbing that Url with the correct parameters and pasting in browser will display the list of document for the target CRM record. In short, all you have to do is display that Url constructed properly inside an iFrame on your CRM form (see illustration below). Please note that this can have a performance impact on how quickly the form loads (this component can take longer to be loaded and displayed.